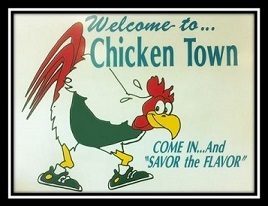 Welcome to Chicken Town, located in the Bellcrest Plaza on Fischer Blvd. in Toms River, NJ. Chicken Town serves up delicious take-out, dinners & caters commercial & private events. Our food includes Barbecue, Chicken, Ribs, Seafood, Salads, Sandwiches, Subs, etc. Chicken Town creates all food to order & never ahead of time. We have an extensive menu that contains snacks & dinners to family & party plans, so “Come in & Savor the Flavor”! Asbury Park Press 2010 Reader’s Choice for the “Best Chicken Place” in Ocean County! If you like Chicken, Chicken Wings, Italian Hot Dogs, Ribs, Seafood, Salads, Sandwiches & Subs, then we are the place for you! Eat In, Take Out or use us to Cater your next event (See our catering menu)! All Items are Cooked to Order in Cholesterol Free Pure Vegetable Oil. Open everyday from 11:00 am to 10:00 pm except holidays. See our Hours of Operation Page. We presently serve the Toms River, Silverton & Island Heights areas.